Some times the best meals are the simplest. 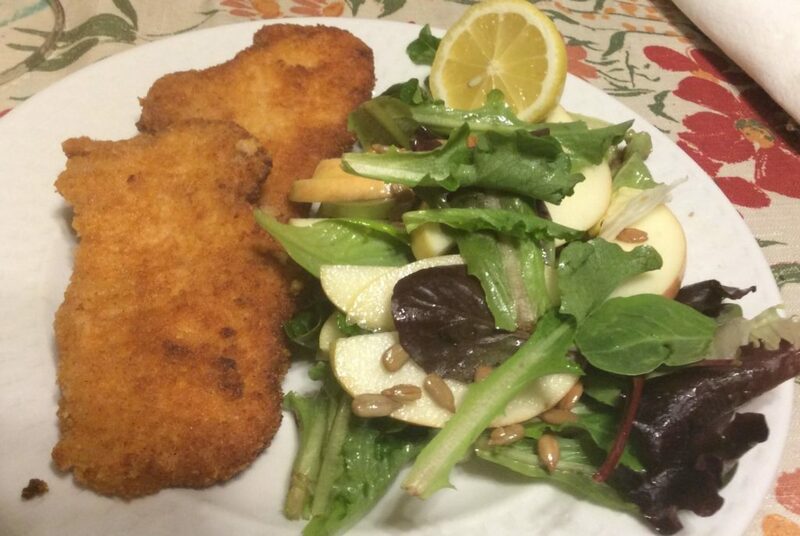 There is nothing complicated about this HelloFresh meal of Breaded Pork Cutlets with Garlic Bread and an Apple and Sunflower Seed Salad. Nothing exotic. It can be simply put together with supermarket staples that won’t have you searching around up and down the aisles and things you already have in your pantry. And it’s very tasty and very satisfying. All the ingredients came fresh and stayed that way, even though I cooked the meal four days after it arrived. The pork wasn’t dry and the seasoning was spot on. However, they listed the amount of kosher salt to add, but they neither included it in the kit or listed kosher salt as a needed ingredient. I didn’t have kosher salt around, so I used a smaller amount of table salt. The original recipe called for breading the pork in a plastic bag, but I used a bowl as I didn’t have a gallon ziplock bag around and I’m already using too much plastic by getting these meal kits. A bowl worked just as well. I very much enjoyed the salad. Mine came with mixed greens – though I see HelloFresh also offers it with just arugula – and a yellow apple (golden delicious?). The dressing was olive oil and lemon juice – I’ve not been fond of this combination in other salads, but it worked here. The star of the show were the sunflower seeds, however, which added crunch and a faint sweetness to the whole thing. I’m not giving this kit a perfect 10, however, because Hello Fresh did not include the butter needed to make the garlic bread and I didn’t have any at home. I suppose I could have looked at the list of ingredients that I needed to have at hand for this recipe before I chose it, but the whole point of meal kits is to not have to go shopping for the ingredients. Particularly in the case of this meal, where all the ingredients are so easily available, if I’m going shopping for butter, I might as well pick up the rest and cook the meal for a fraction of the cost. I understand that Hello Fresh is trying to save money by not providing the butter, but it’s still not cool. In any case, I think oven-baked garlic bread is not a good choice for this meal. Both the pork and the salad can be put together rather quickly, but making the garlic bread requires preheating the oven, which is both a waste of energy for such a small meal, and a waste of time. Instead, they could have suggested toasting the bread in the same pan where the pork was cooked. I’m also dinging the recipe because I was still hungry when I finished – even though I ate a lot of salad (there was plenty of it). Perhaps that’s due to not being able to make & eat the garlic bread. After the discount, I paid $14 for this kit or $7 per serving (regular price would have been $20/kit or $10/serving). In a medium bowl, combine breadcrumbs, salt and spices. In a different bowl or plate, coat pork cutlets with sour cream (you may need to use your fingers to spread it). Transfer the cutlets to the bowl with the breadcrumbs and coat well. Heat a 1/4″ layer of oil in a large skillet over medium-high heat. Once hot, transfer cutlets into the skillet and fry on each side, about 2-3 minutes per side. Transfer to paper towels to absorb extra oil. Serve with lemon wedges on the side to squeeze on the cutlets. Core the apple and slice into thin slices. Thinly slice the celery. Put apple, celery and spring mix into a medium bowl. Dress with olive oil. Squeeze the lemon half on it and mix. Add the sunflower seeds and mix again.